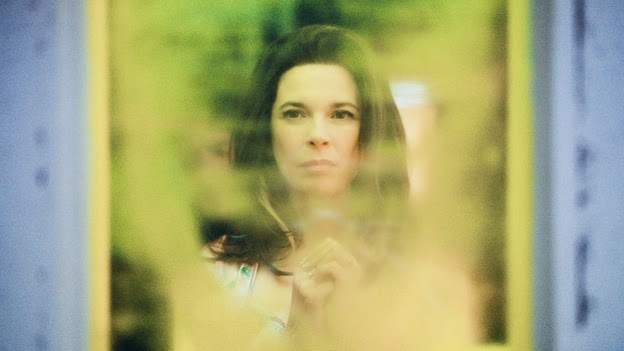 MOMMY is Xavier Dolan’s greatest film and indeed one of the best in this year’s festival. It’s brutally authentic, emotionally captivating and technically astonishing. It rightly one the Special Jury Prize at Cannes this year and confirms him as one of the emotionally literate and astute directors of his generation. I’ve had issues with Dolan before - in terms of his pacing, repetition, bagginess and over-use of cinematic technique - but none of that ill-discipline is evident here. Rather he has honed his craft, pared down his view (quite literally) and delivered an unforgettable unique and vital film. The film stars Dolan regular Anne Dorval as Diane - the exuberant, feisty mommy who is desperate to keep her son Steve (Antoine-Olivier Pilon) out of juvenile detention and ultimately a mental institution. Society may have branded her son a troublemaker and a reject but she is a mother, with all the tenacity, sacrifice and fierce love that this entails. She matches Steve’s energy and joy - and despite any judgments we may make about her appearance, manners and language - she is utterly at peace with herself. And that in itself is a rarity on screen these days. The second strong woman in the piece is Kyla (Suzanne Clement) - at first a hesitant, nervous and compromised personality who is brought to life through her interaction with Steve and Diane. It’s almost as though she abandons her conventional family (husband, daughter - who we never see) to become the third player in the weird set-up across the road. Diane becomes breadwinner, Steve the child, and Kyla home-schooling him, the mother. And so the relationship blossoms, but always with the threat of Steve’s extreme ADHD in the background, forcing Diane and Kyla to make tough choices about what is truly best for him. As ever Dolan has a keen visual style and a particular sensitivity for setting key melodramatic set pieces to music. He doesn’t disappoint here, but keeps the number of these set pieces in check. Moreover he pulls off a neat conceptual trick by the filming the movie in 1:1 aspect ratio - a tight boxed close-up of character that literally cuts out any peripheral distractions. In a couple of astonishing moments, utterly in synch with the emotional journey of the characters, this concept is over-written, and the result is absolutely breathtaking and immersive. It makes movies that are content merely to put a story on screen in a conservative and obedient manner (TESTAMENT OF YOUTH, I’m looking at you) seem completely passé and redundant in a festival of this calibre. Kudos to Dolan and I can’t wait to see what he does next. MOMMY has a running time of 134 minutes. MOMMY played Cannes, where Dolan won the Jury Prize, Telluride, Toronto and London 2014. It opened earlier this year in Canada, Belgium, France and Luxembourg. It opens in Germany and the Netherlands on November 13th, in Italy on November 27th, in Spain on December 5th and in Romania on January 23rd.